Welcome to our new Children’s Ministry blog, where I plan to keep you up to date on all of the amazing things our children are accomplishing through this ministry! Stay tuned each week for announcements, photos and recaps from our various children’s activities! I had the privilege of starting to get to know more of you over the last week and look forward to more discussions! I sat in on Sunday school where our students discussed the miracle of Jesus and the Cana Wedding and attended God Squad where we ate pizza and discussed The Ten Commandments and the importance these rules play in our everyday lives. We honed in particularly on the importance of loving one and only one God, making good decisions, doing the right thing and loving our neighbors. RoxAnn Rhoads and Liz Hansen will continue to work with the lower elementary students on Wednesday nights and Tom Acton will work with middle and older elementary kids. If you wish to volunteer for Sunday School or God Squad please don’t hesitate to let me know! We have an amazing group of teachers for both events, but can always use more help and substitutes! Don’t forget…Bell Choir will resume next Wednesday, Jan. 27. Parents, it has come to my attention that there could be some complications for child pick-up times with the different age levels. If you ever need to pick up a younger child later following confirmation or choir and don’t want to make two trips, please let me know. I am happy to stay around and help bridge that gap for you! 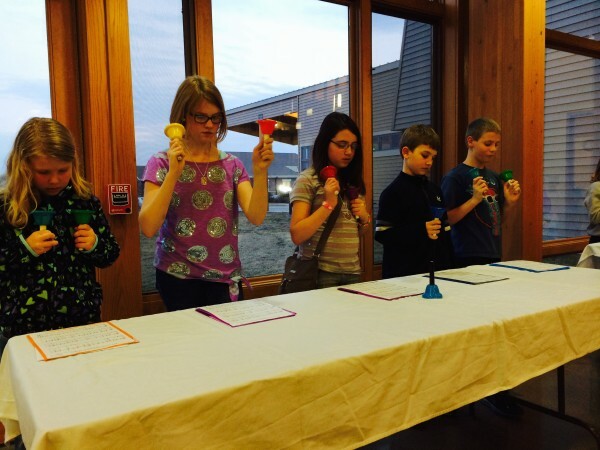 Bell choir resumes on Jan. 27!